Sometimes I forget how tiny these puppies are. Usually a good bath refreshes my mind that most of their size comes from their fluff! Trina brought Bentley over for a visit, and he has had his first haircut. His fluff is gone and he is just soooooo tiny! He is weighing in at 3.5 lbs! He has been having a fun day of playing with his mom and snoozing on my lap. We even went out to the store to pick up some more dog treats. Here are some super cute pics of him! Bentley is getting so big! Daisy is so excited when he comes to stay for a few days. They love to wrestle and play with each other. The paused during a wrestle match to look at me, so dang cute! 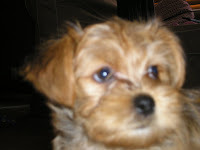 Nope Bentley is not an old man... his daddy had gray across his forehead too! Uncle Eddie came over for a visit with Bentley's Grandma Ella. 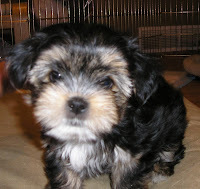 Eddie is a Shih Poo and loves to come over to play with Daisy and Bentley. Of course with Jake, Eddie, and Bentley in the same room there was a bit of alpha male trying to come out of each of them! I lucked out... a few days after Ace left, Bentley came back for a visit. Daisy and Bentley played for 3 hour straight! 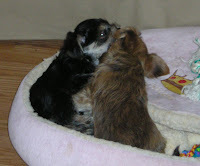 She was very excited to have Bentley around, she just can't play with Jake the way she can with her pups. Daisy is not possessed but Ace is pinned! Last Thursday little Ace went to his family. He was so excited to see them and I know he will be well taken care of, with a family of 7 he may not get to walk much! 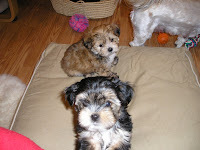 I'm sad that all the little puppies are gone, they have been so much fun to have around the house. I'm grateful that they were all able to go to such wonderful new families. I will continue to update when I receive pictures from their families. Of course Bentley still comes over a few times a week when his Mom goes to work. 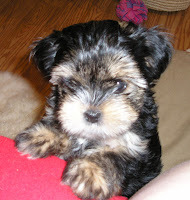 Which helps me continue to get my puppy fix! Funny thing about Bentley is he is the Houdini of the group. Try to contain him to an area and given some time he will figure a way out. When Trina drops him off this week we are going to see how he does with a doggie door. Or course I'm going to have to do a boundary check to make sure he can't get out of the back yard. I will post some pictures later tonight of Ace's family. I was in such a rush to get packed I didn't get a picture of Duke's new family, but I'm hoping they will email me one soon. Sorry about the delay ... I am on vacation on the east coast.. you can read about it here.. 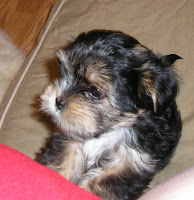 I will get new pics of the puppies and their new families up when I get back. Duke is currently excited to meet his new family. 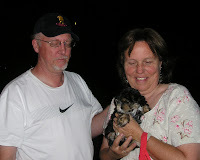 Letting Puppies go is the hardest part of this entire experience. But I've been really lucky to have them go to really wonderful people! My friends son DJ loves to come and play with the puppies. He is so good with them and they just love him to death. We went outside to let the puppies run and the girls from the neighborhood came over to see the puppies. They are so much fun to watch. 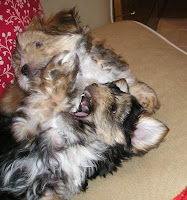 The girls love to scream and giggle as the puppies chase them. 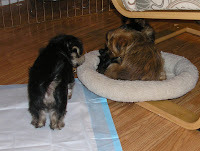 Here are some videos of them playing, its a great way to wear the puppies out. Ace is still super tiny! Such a cute baby doll face! I could just watch him for hours! Lenny and Ace begging to come up on the couch... again! Bentley came back to spend a few days with us.. here are some pics from the sleep over party. Duke and Bentley cuddled up for a nap. What is a sleep over without fun snacks? Lenny loves Bentley's bed too! I tried to get a pic of him sleeping but dogs can always hear the shutter click open. I'm innocent of everything... how can you resist this cute face! Lenny is becoming such a character! Please put me on the couch! 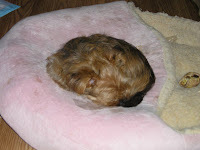 Yes it's a Pink Princess shoe bed.. Lenny loves to curl up and nap on top of it. 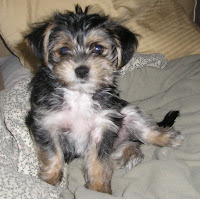 I was checking out to see what others in my area are selling their shorkies for today. I'm still convinced that my puppies are the cutest of them all! 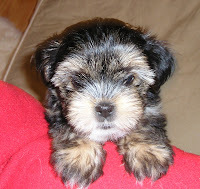 Shorkies are a super cute breed to start with, but I really wanted that teddy bear/ baby doll face. 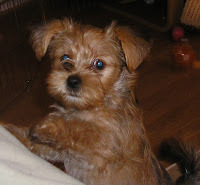 I find that most Yorkies have too long of a snout, or their nose is a bit larger then I like. When I found Dante I knew he'd be a perfect match for Daisy. Both have cute little noses as well as that adorable baby doll face. His coloring is incredible as well. I believe that is why Lenny has such a gorgeous carmel color. 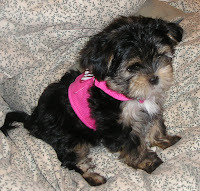 I haven't seen another Shorkie with this color and I absolutely love it! Unfortunately another seller in this area has the same blog template as I do. I'm not sure if they have copied mine or we are just two great minds thinking alike. So I decided to change the template to differentiate from theirs. I'm thrilled with the new look. I love the brown pink mix and think this matches better then the argyle one I had before. Tori goes to her new family Monday so I've been spending extra time with her. I sort of dragged my feet putting up an ad for Duke and Lenny because I just love having them around so much! I know there is a special family out there that needs them, but it is really hard to let them go. A friend from work decided she wanted to have Bentley be part of her family, so tonight she picked him up and they headed home. Bentley and I waited outside and when Trina showed up Bentley raced across the yard and into her arms. I'm so excited for his new adventure but had to shed a tear as he headed on his way. I will miss our cuddle naps and his fun personality around the house. Here are some pics of Trina and Bentley. The Puppies still love to be on the couch but can't quite get on the couch without help. I've put a cushion on the ground so they can jump down onto it. But they just aren't big enough to jump up on the couch, no matter how hard they try. So I see this view a lot! Pleeeease let me up! !